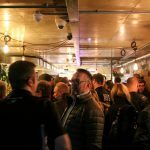 Ride Culture – a celebration of the resurgent bobber, café racer and retro motorcycle scene – will kick off with a preview party at Bristol’s Paintworks on Friday 12th May at 6pm. 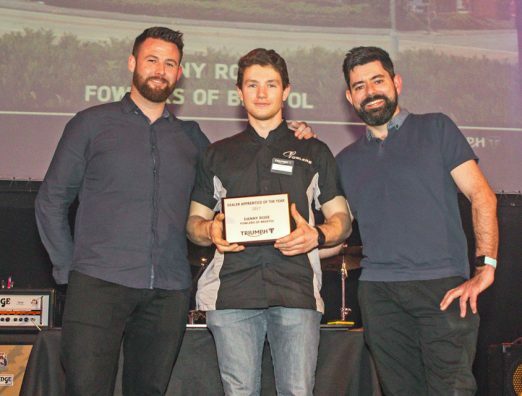 Fowlers, Bristol’s well-known and long-established motorcycle dealer, will be supporting this exciting new event, to help get it off to a strong start. 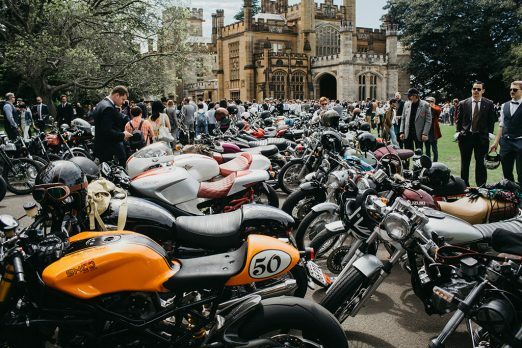 The team at Fowlers has picked a selection of cool machines to bring to the show, including its own ‘take’ on the all-conquering Triumph Bobber, plus a pair of Yamaha’s yard-built custom machines and a Moto Guzzi V7 Sport in retro colours. 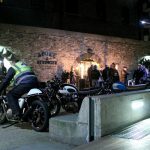 Named the best place to live in Britain by the Sunday Times, Bristol has become associated with all things cool, and riders involved in this alternative bike culture felt that the time had come for the city to host its own special event – with a unique Bristol twist – along the lines of the Bike Shed (Shoreditch, London) and The One Show (Portland, USA). 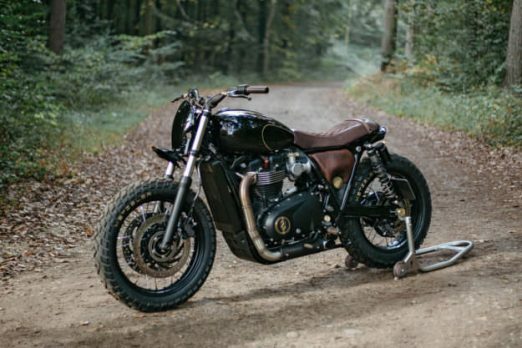 Curated by Spoke & Stringer, the show will feature back-to-basics machines that capture the raw pleasure of motorcycling, like Down & Out’s awesome custom Bobber (one of the highlights of the NEC) and Old Empire’s classy Bonneville T120 (below), alongside an assortment of factory customs from Triumph, Yamaha, Ducati and BMW. Individual and team builders from across the South West will also be displaying their creations. 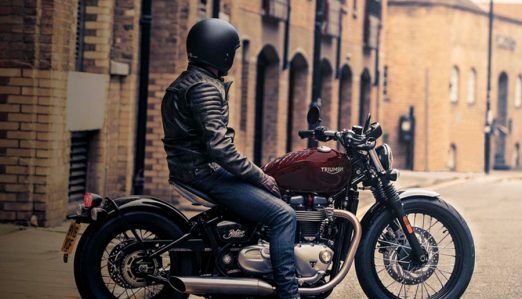 Fowlers will be bringing a hand-picked selection of the coolest clothing and helmets from some great heritage brands for you to see, such as Belstaff, Bell and Hedon, featuring authentic-looking retro ranges to help you look as good as your ride! 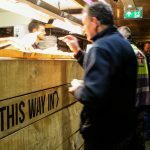 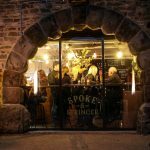 PLUS Street food from Spoke & Stringer’s award-winning kitchen, craft ales, local cider and Easy Jose speciality Coffee. 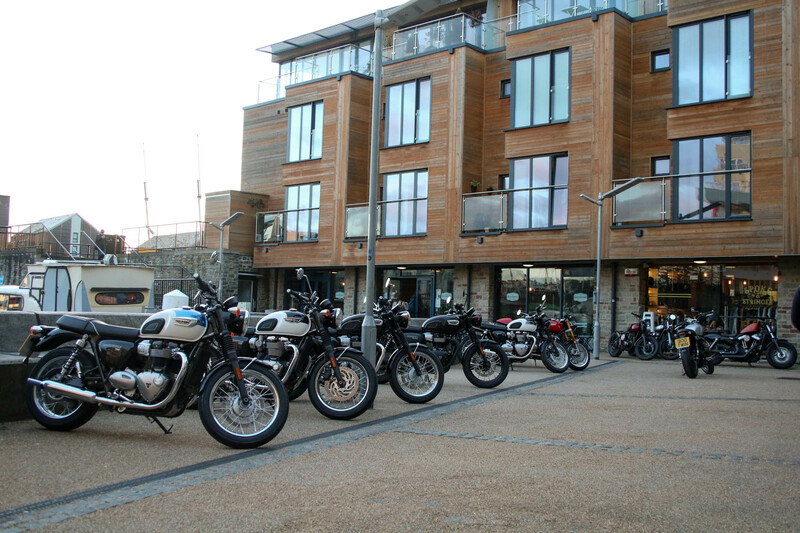 Paintworks is a stylish event space in Bristol’s ‘Creative Quarter’, just a couple of minutes’ ride up the A4 Bath Road from Fowlers’ spectacular showrooms, where you can see new bikes from Moto Guzzi, Triumph, Yamaha, Suzuki, Aprilia, Honda, KTM, Husqvarna, Piaggio and Vespa, plus hundreds of pre-owned machines of all makes. 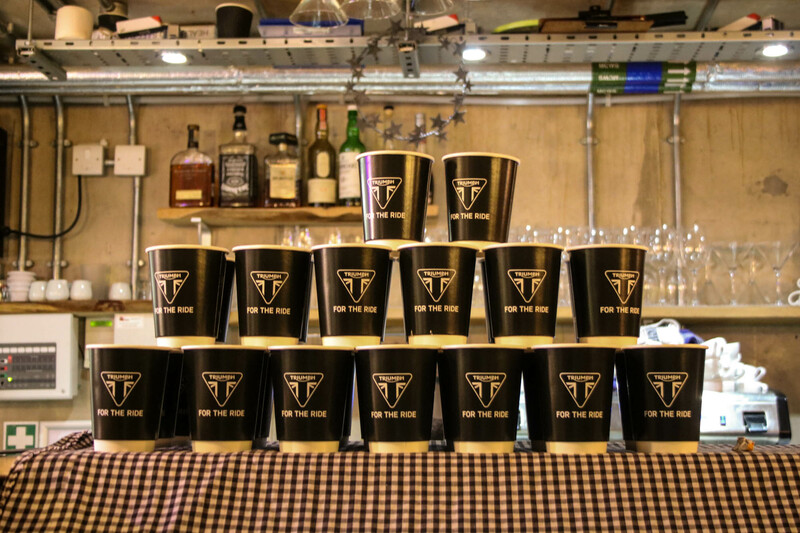 Hurry….space is limited and they’ll be sure to sell out fast! 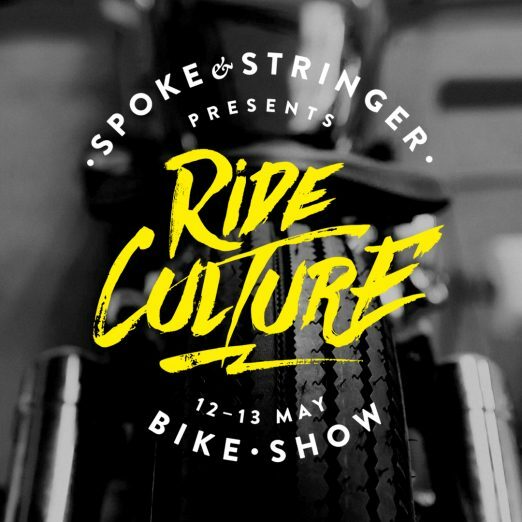 Ride Culture is more than just an event – it’s a life-style! 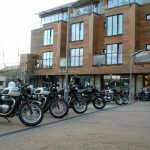 This entry was posted in Events, News, Triumph and tagged Event, Ride Culture, Spoke & Stringer on 05/05/2017 by Fowlers News. 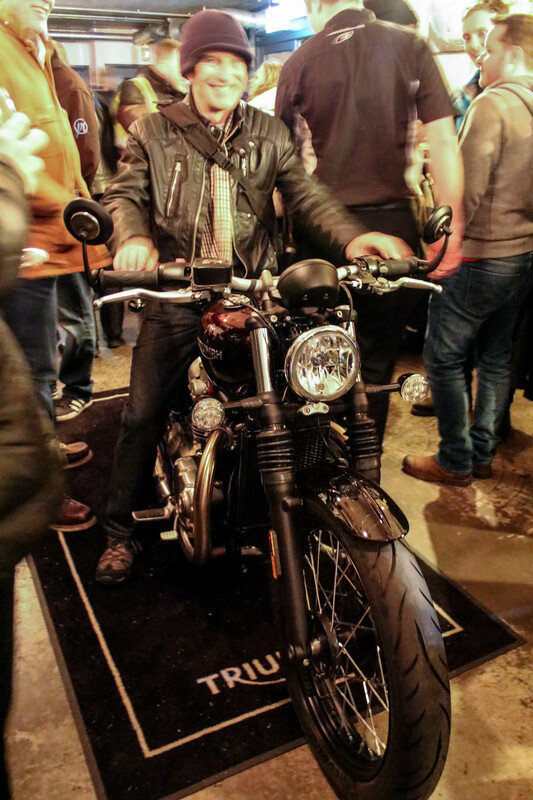 Launch night for the Triumph Bobber in Bristol a success! 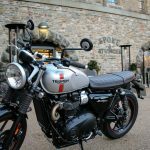 Triumph announced their ground-breaking new Bobber in October 2016, using the massively popular T120 engine, but with a retro look and quality of styling rarely seen in a stock bike. 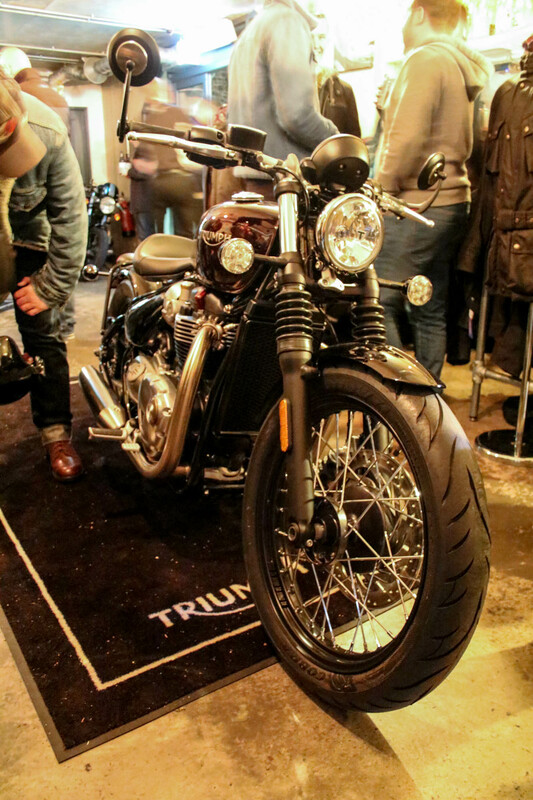 The Bobber was an immediate hit with fans all over the world, and the launch was highly anticipated in 2017. 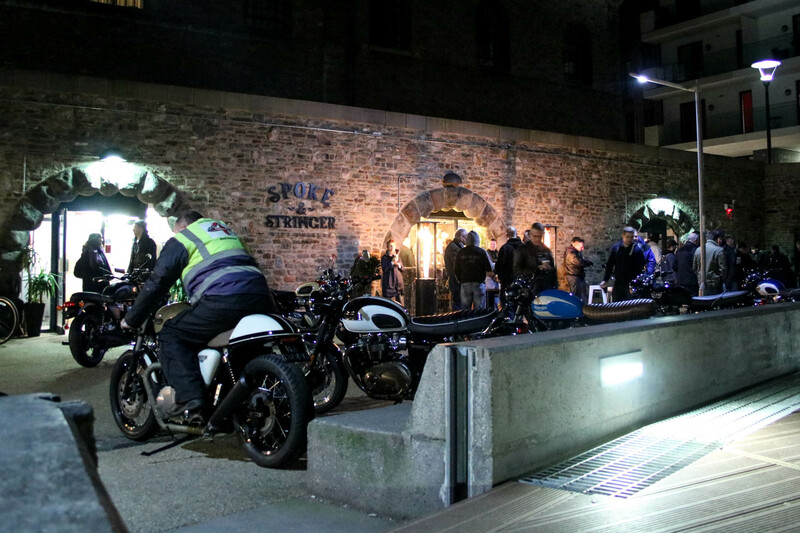 As the day came around to unveil both the Bobber and the new Street Scrambler, Fowlers and Spoke & Stringer, a stylish surf and bike cafe in the Bristol harbour, got together to plan a launch event of a suitably cool calibre. 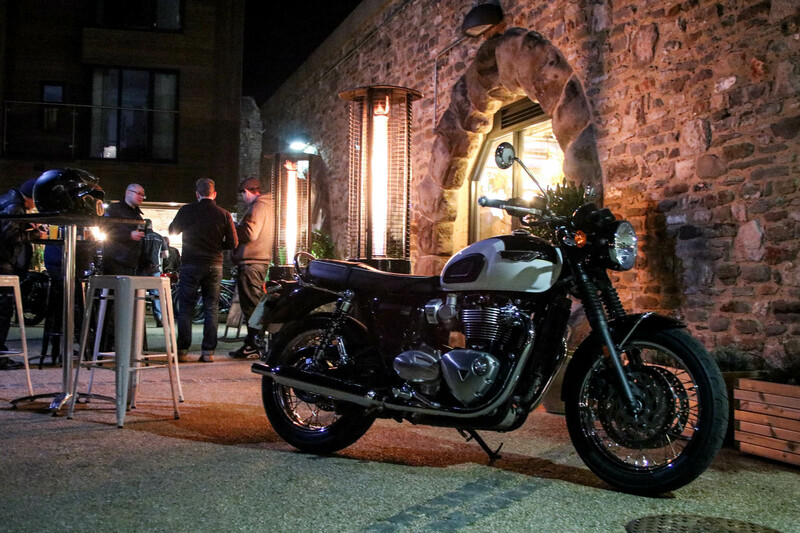 The entire Bonneville range was present on the night, showing off Triumph’s current range to its best – in addition to a handpicked selection of Triumph-branded clothing and accessories. 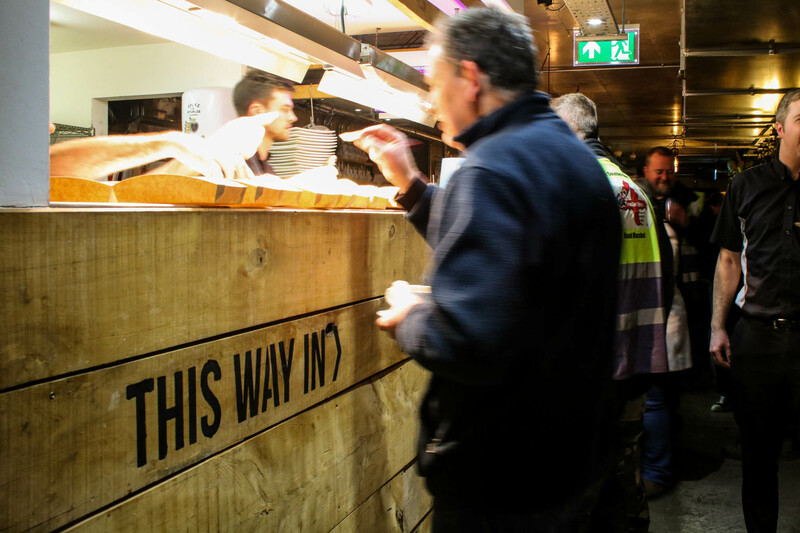 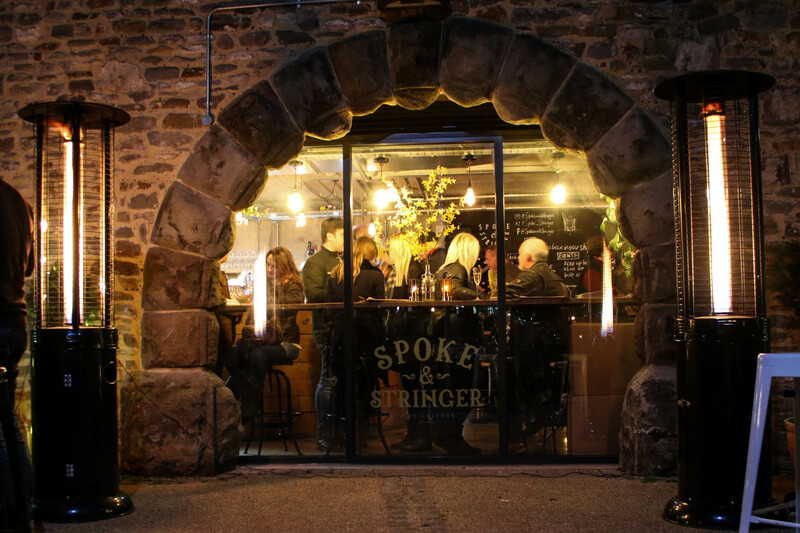 Spoke & Stringer provided a delicious buffet – moroccan street food, rich coffees and a great selection of artisan beers and ales. 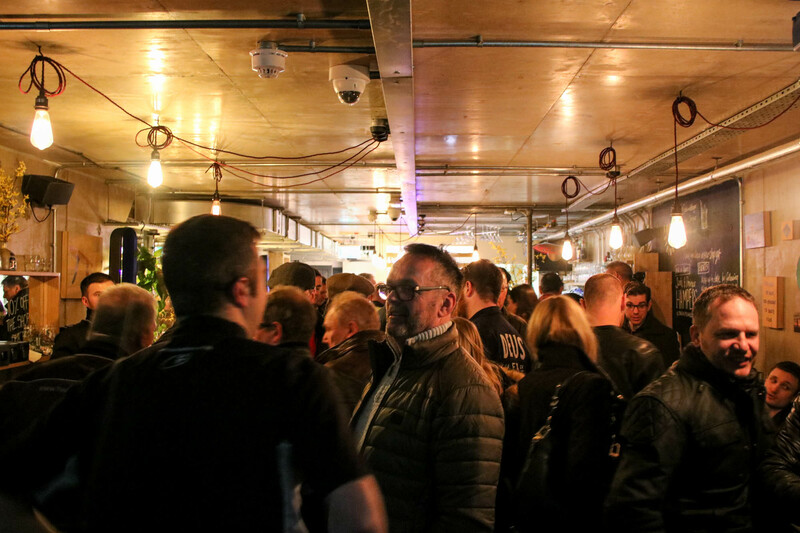 Around 140 guests attended, and quickly packed out the small cafe. 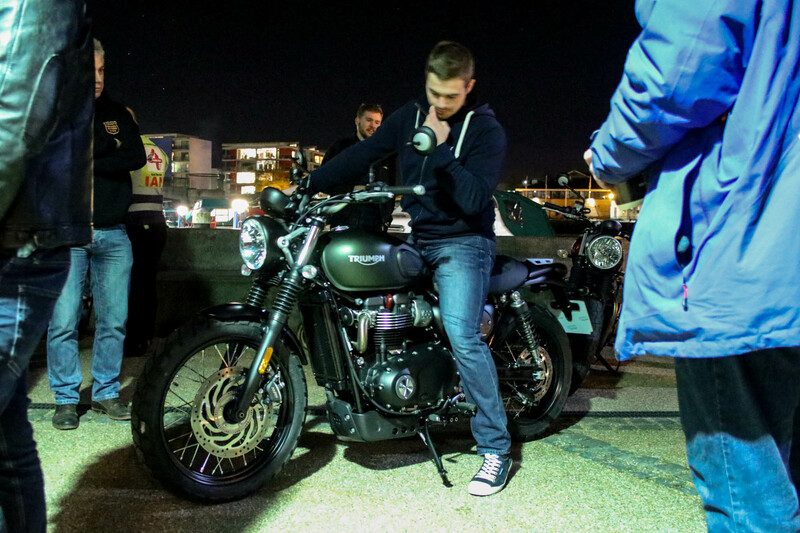 The unveiling was preceded by a short video, showing the Bobber and Street Scrambler gliding through sun-kissed gorges – a bit of a contrast to the cold and darkness falling outside! 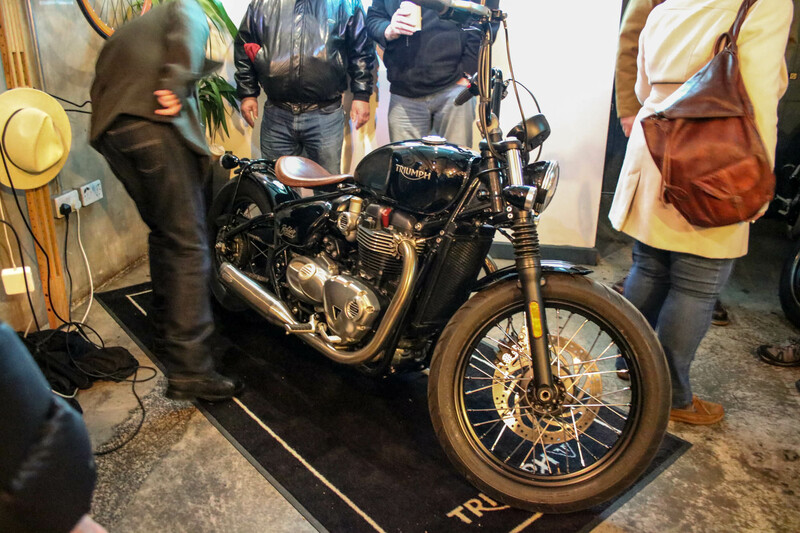 The finale was heralded by the roaring of both bikes’ engines, and the Street Scrambler and iconic Bobber came thundering into the crowd, through the front doors, to take pride of place in the lobby. 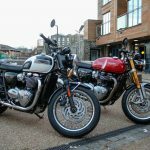 Seats were sat on, details admired and lots of selfies taken – cementing the Bobber and the Street Scrambler as another two fantastic additions to the Triumph Bonneville stable. 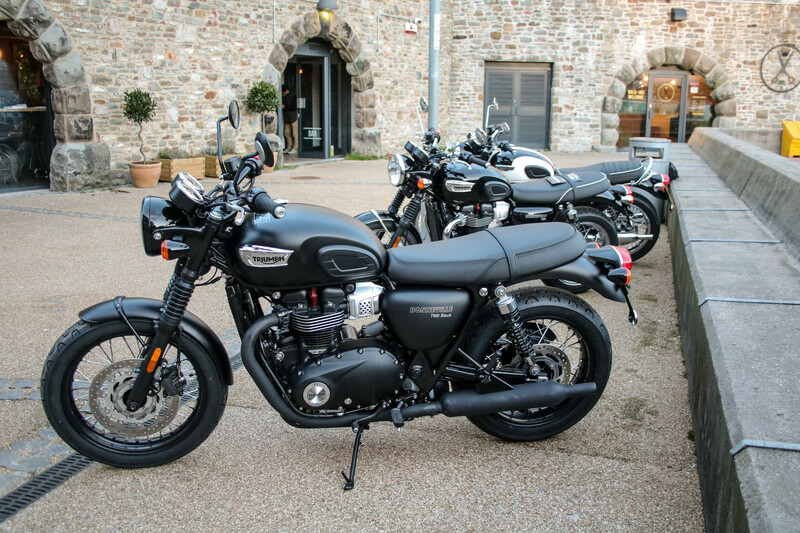 Photos from the event are below – if you’re interested in any of the Triumph Bonneville range, including the new Bobber and Street Scrambler, please get in touch with Fowlers Triumph on 0117 977 0466. 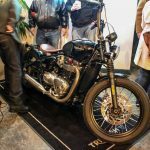 This entry was posted in Fun, New Bikes, Triumph and tagged Bobber, Bonneville, Events, Launch, New Bikes, Triumph on 24/02/2017 by Fowlers News. 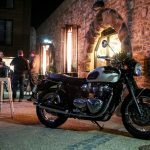 Triumph have released a custom version of their massively popular 1200cc T120 Bonneville – the Bobber. 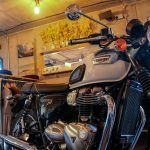 Stripping the Bonneville T120 back to basics, it delivers all the hallmarks of a real bobber: clean lines and low stance, single seat, wide flat bars, minimal bodywork and headlight, sculpted tank, wire spoked wheels, with wide rear wheel and that all important hard tail look. 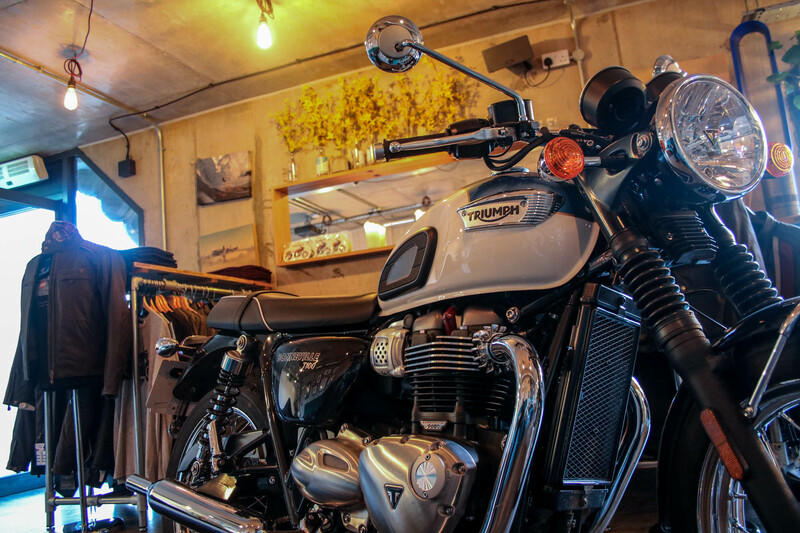 The frame, chassis and suspension is all-new too – a custom bike without the custom headache! 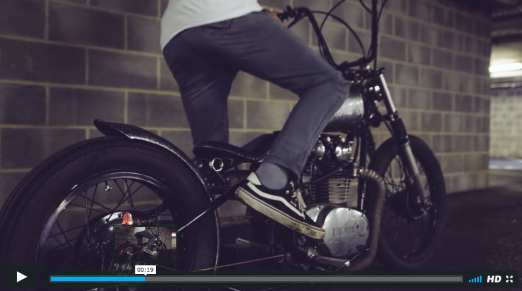 The authentic battery box with stainless steel strap, drum brake-styled rear hub and rear fender loop add small touches of style that make up a whole Bobber. 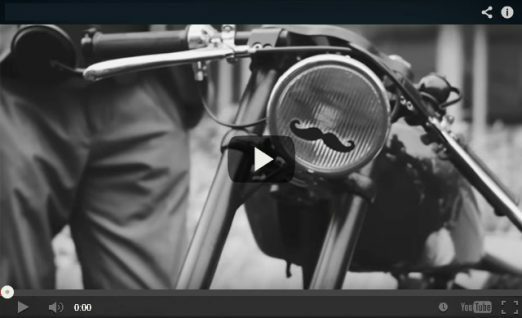 The ignition barrel, located on the front right-hand panel, adds a touch of authenticity. 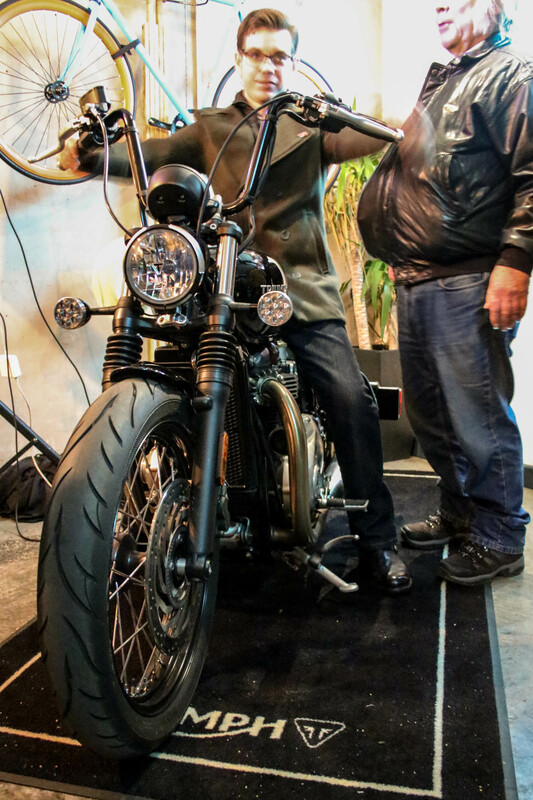 Bar end mirrors and all-new risers complete the look – but there are over 150 accessories that can be added to make your Bobber truly yours. 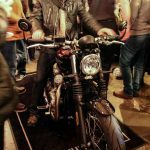 Look out for the gorgeous Triumph Bonneville Bobber at Fowlers in 2017! 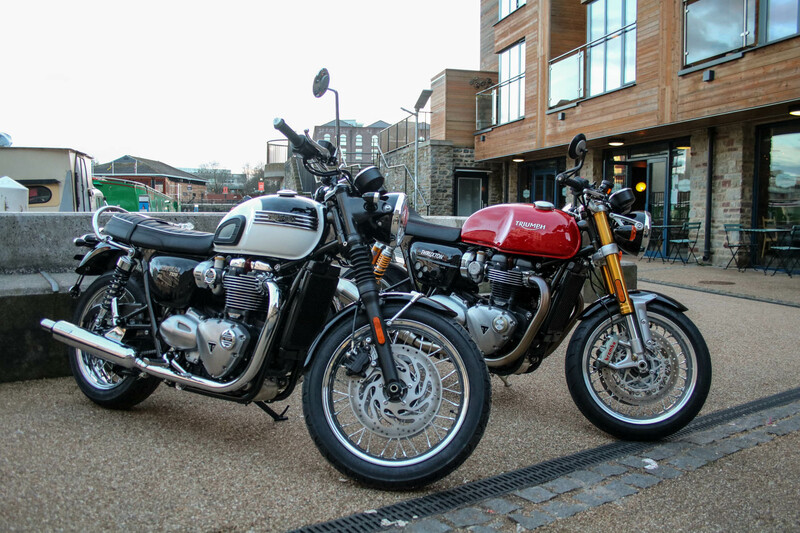 This entry was posted in New Bikes, Triumph and tagged Bobber, Bonneville, T120, Triumph on 20/10/2016 by Fowlers News. 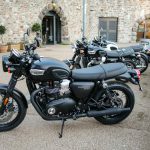 With their release of the new Street Twin earlier this year, Triumph are certainly not resting on their laurels, and the release of three new T100 bikes at Intermot will only help to draw more riders to the retro-inspired side. 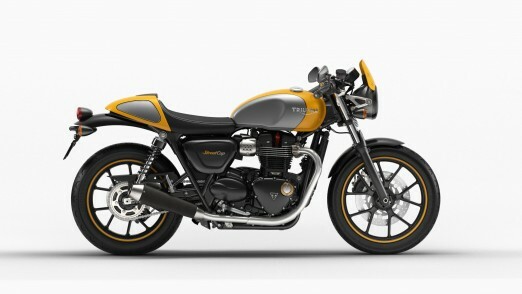 The Street Cup, a gorgeous cafe racer-inspired version of the new 900cc T100 range, features an exclusive bullet seat, dropped Ace bars, a seat cowl and colour-matched flyscreen. 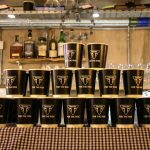 The standard T100 has also benefitted from a refresh, available in an all-black colourway as well as the classic blue or orange, and white paint scheme. 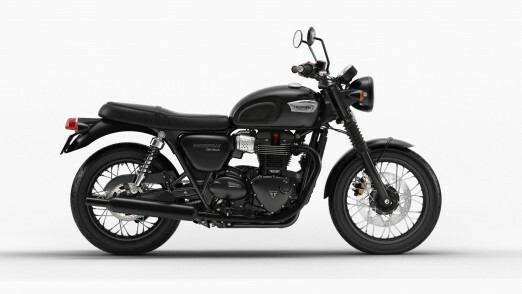 Triumph’s accessory range is also next-to-none, with over 150 parts available to truly make your Triumph your own. 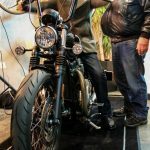 Based on the Street Twin platform, an A2 restriction kit is now also available, meaning that A2 riders now have the option to own one of the hottest, most stylish looking bikes around. 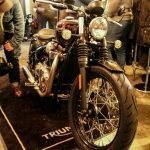 This entry was posted in New Bikes, Triumph and tagged Intermot, T100, Triumph on 04/10/2016 by Fowlers News. 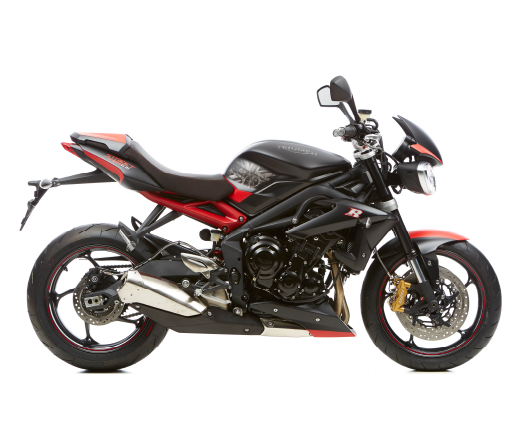 To celebrate 10 years of the much-loved Street Triple, Triumph have released three special editions, in collaboration with 8 Ball, the world-famous bike paintwork and airbrush team. 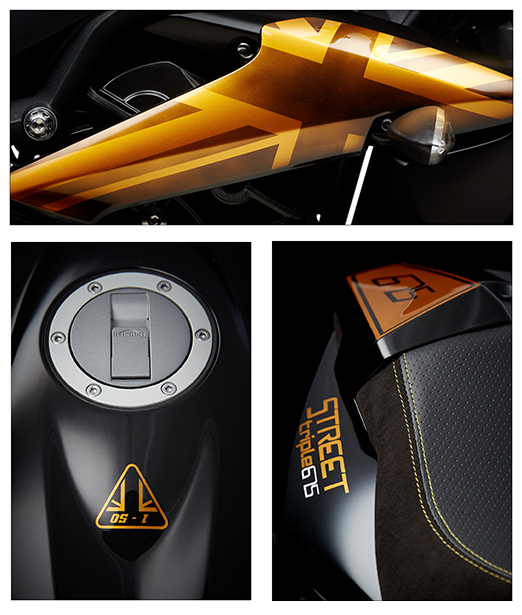 Just 50 editions of each of the Dark, Gold and Grey Street Triples will be available, each with their series edition number painted on the tank. 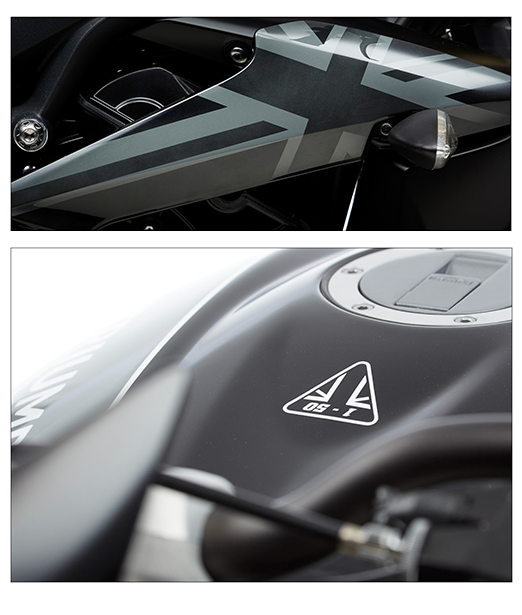 Each edition features an Alcantara seat with colour-matched stitching, as well as a bellypan, flyscreen and cowl. 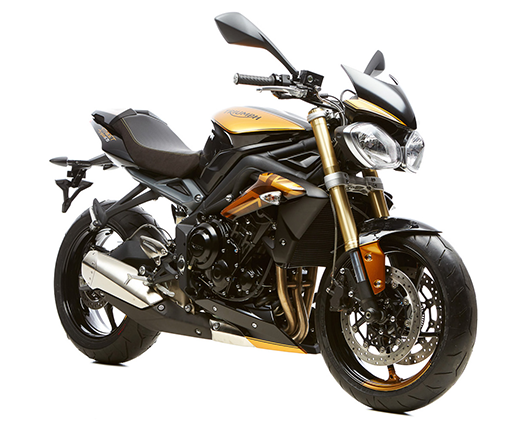 The Street Triple was released at the end of 2007, and the agile, versatile favourite has been winning hearts ever since. 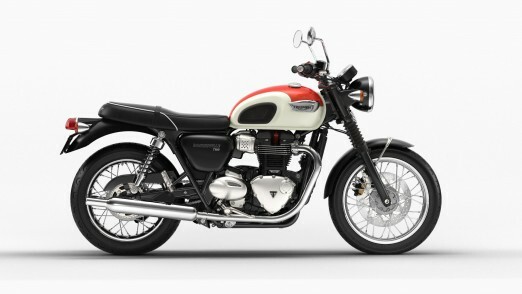 With a light chassis and aggressive styling, it’s a bike that can make an everyday commute feel like a weekend blast. 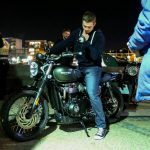 Updated in 2014, the lighter chassis added even more punch and more nimble handling to this already quick 675cc inline-triple. 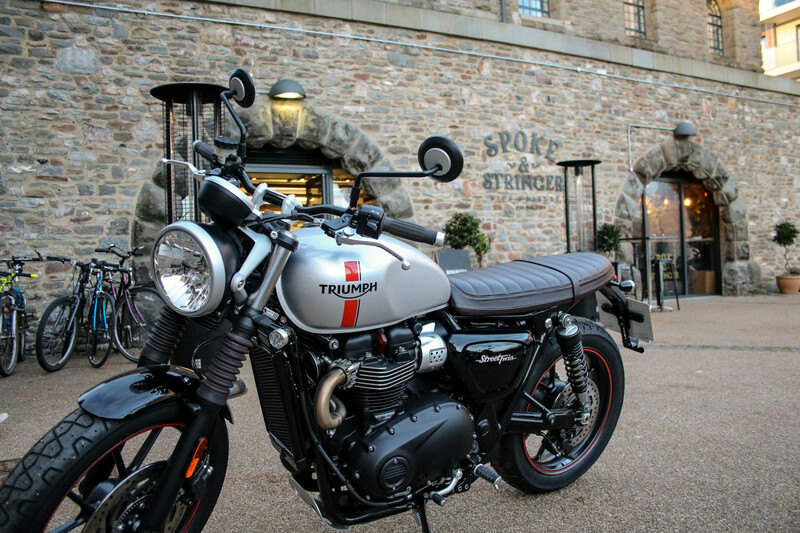 To get your hands on one of these limited edition models, please get in touch with Fowlers Triumph online, or call 0117 977 0466. 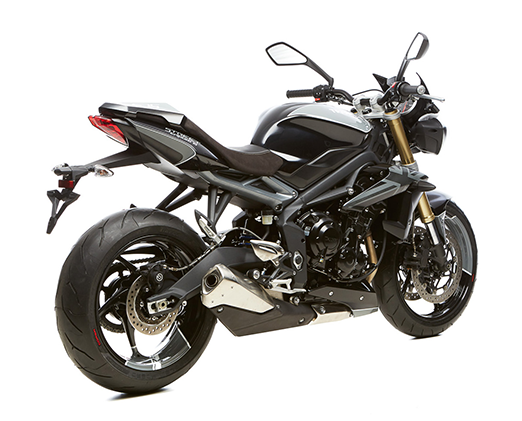 This entry was posted in New Bikes, Triumph and tagged 8 Ball, Limited Edition, Street Triple, Triumph on 03/10/2016 by Fowlers News.